The prairie, which includes a covered former landfill, is not open to the public yet, but plans are underway for a multi-use trail and scenic overlook. Where some see an old dump site, others see a special opportunity. Troy Clark is one of those people. Standing atop the highest point of St. Johns Landfill in North Portland, Clark can hardly contain his enthusiasm. "I love this place," he declared while pivoting to take in the panoramic view. "On a clear day you see Mount Rainier, St. Helens, Adams and Mount Hood. This is a gem, a beautiful spot!" With binoculars slung around his neck and leather-bound notebook in hand, he brimmed with excitement for the hours of birding ahead. Clark, a retired mail carrier and avid paddler, says he spotted 66 species on his "peak day" of birding last year at Smith and Bybee Wetlands Natural Area, which includes the landfill. Immediately enthralled upon discovering the area several decades ago, he formed the Friends of Smith and Bybee Lakes advocacy group. He spends two or three days a week bird watching at Smith and Bybee Wetlands, and he feels a great sense of responsibility to protect it. For 50 years, nearly 14 million tons of trash generated across Portland was dumped in the St. Johns Landfill. Metro took over ownership in 1990 and closed it with a landfill cover system. Now Metro is transforming the landscape of the 240-acre site. 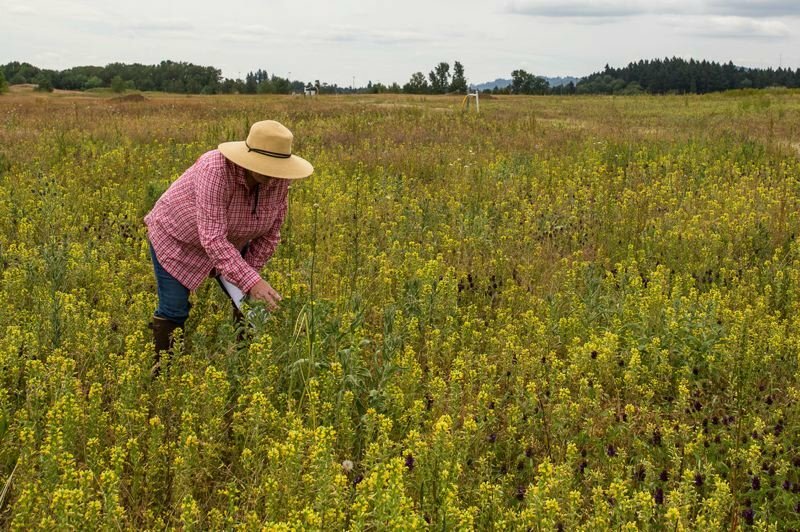 Through a multi-year habitat restoration effort, a beautiful prairie is emerging – alive with native wildflowers and other plants that attract rare birds like western meadowlarks and streaked horned larks, western painted turtles and other wildlife. The landfill restoration offers a unique opportunity, since there are few large protected prairie or grassland habitats in greater Portland. Much of it has been developed or sits on private farmland, says Elaine Stewart, a senior natural resources scientist at Metro who is leading the prairie enhancement efforts. "When you look at St. Johns, you see it's a closed landfill," Stewart said. "But if you just step back and look at it, you see this expanse of more than 200 acres of grassland and you think, 'Wow that could be really special!'" The vision is to provide healthy habitat for insects, wildlife, grassland birds, and pollinators like butterflies and bees. Stewart began the restoration by seeding wildflowers in 2013. The effort is supported in part by voter-approved parks and natural areas levies and a federal grant. Approximately 68 acres have already been planted, and preparations are underway to seed 75 acres in fall 2020. Last spring the prairie exploded with color: pink meadow checkermallow, white and yellow popcorn flower, peach collomia and yellow tarweed. By late summer, yellow gumweed and white yarrow stood out. Stewart, with assistance from staff and volunteers, closely monitors the evolving habitat and wildlife that use it, applying lessons learned in each successive planting. "What native seeds are available?" "What do pollinators need?" "What plant mix ensures flowers bloom all summer and spring?" "How do we attract grassland birds?" Birds are one indicator of healthy habitat, says Metro senior science analyst Katy Weil. Healthy birds mean healthy bugs, and healthy bugs mean healthy habitat. By that measure, St. Johns Prairie is succeeding. "I've gone from seeing a handful of species 10 years ago during a bird breeding survey to well over 30," Weil said. "That's pretty significant for a piece of land this size in the middle of industry." She's been happily surprised to see northern harriers training juveniles to fly, a doe giving birth and the occasional elk following her around the prairie. Weil is particularly excited about the nighthawks. Staff in recent years also created habitat and broadcasted recorded vocal loops specifically to attract streaked horned larks, which are federally listed as threatened. Staff happily saw a male lark in 2018. The closed landfill is not open for public access, but visitors could soon enjoy a trail around it. Planners envision a multi-use paved trail from Chimney Park, winding around the prairie and connecting to the 40-Mile Loop a few miles north near Kelley Point Park. The trail would also connect to a prairie overlook with stunning views over North Portland, the wetlands and distant mountains. Metro staff are determining the scope of the project, conducting feasibility studies and hoping to start community engagement on the design process as soon as fall 2019. "It's an opportunity to get people from very diverse communities to a quiet place with some of the best nature habitat and bird viewing in all of the city," said Allan Schmidt, a senior parks planner at Metro who is overseeing the trail project. The proposed St. Johns Prairie trail, paired with the city of Portland's planned bridge over Columbia Boulevard, would fill a major gap in the regional trail system. "I'm excited about this section of trail because it will be heavily used by people in North Portland and accessed by people around the region when the full (40-Mile Loop) trail is complete," said Francie Royce, co-founder of npGREENWAY, a group that advocates for the completion of the North Portland Greenway Trail. Opening the site to the public while there's still an active gas system is a concern, says Mike Guebert, the environmental supervisor at St. Johns Landfill. 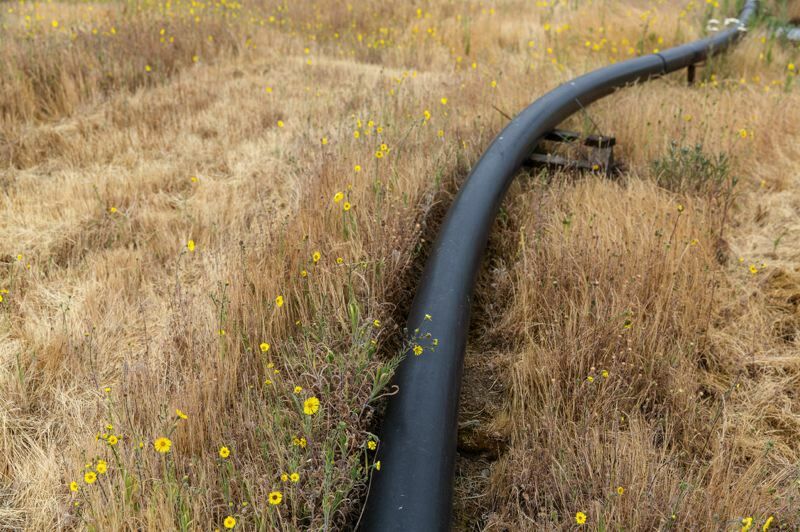 A network of pipes crisscross the grassy surface of the landfill, burning off the remaining methane-gas from the decomposing garbage. Protecting wildlife and public safety will be key. But in overcoming these complexities, a swath of land can transform from a liability to a thriving refuge for people and animals. As a northern harrier swooped low along the prairie's surrounding tree line, Clark, the founder of the Friends of Smith and Bybee Lakes, made a quick shorthand entry in his notebook. Marveling at the beauty around him, he wondered aloud, "Did I find this place, or did it find me?" Bylined articles by Metro writers do not necessarily represent the opinions of Metro or the Metro Council. This story was edited from its original version published at oregonmetro.gov/news.